Play-based learning helps engage elementary students in their education and has cognitive, physical, social, and emotional benefits. A few years ago, I began shifting to a play-based approach in my kindergarten classroom. Research extolled the physical, cognitive, social, and emotional benefits of play and called to mind Friedrich Froebel’s vision of kindergarten as a place where play and learning go hand in hand. As I made small changes in my classroom, I began to understand that play is a primary and integral mode through which children make sense of the world, and that it is essential to their development and well-being. In addition, it supports skills like collaboration, communication, and creativity. 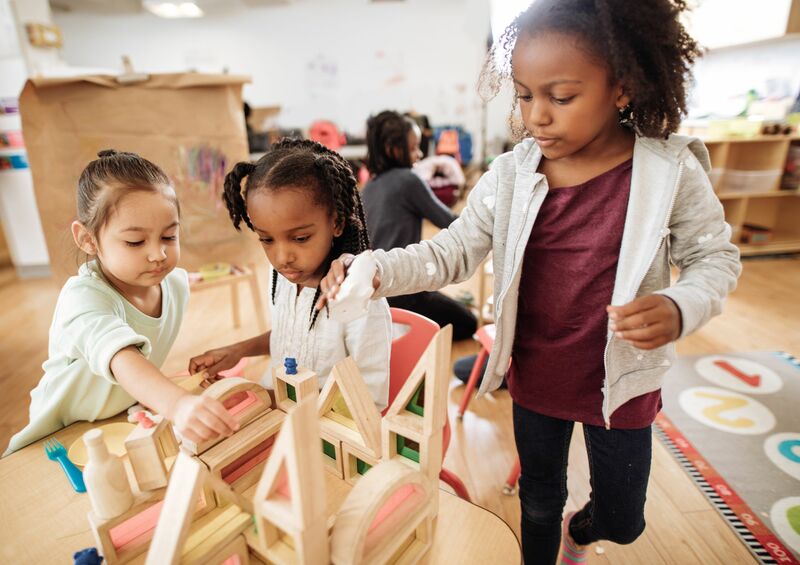 Offering play can feel challenging when mandated programs and standardized tests are requirements of many school districts, but play-based learning is an effective practice for deepening understanding and engaging children. The key is finding a balance between academic expectations and the developmental needs of young students. As I studied children’s play, I saw that their bodies and minds were most engaged and focused when they were offered time, space, and meaningful materials to make sense of what they were learning. Teacher-directed activities and transitions are no substitutes for opportunities for exploration, creativity, and socialization. Using a “choice time” structure like the one outlined in Choice Time: How to Deepen Learning Through Inquiry and Play, PreK–2 affords children opportunities to learn playfully. Making time for play early in the day optimizes learning and helps to balance a classroom schedule. My students have a 30-minute choice time within our literacy block each morning in addition to a 45-minute choice time at the end of the day. The classroom environment is designed to engage their minds, meet their sensory needs, and offer practice with academic content. Our classroom includes a block center, math center, science center, book nook, dramatic play corner, sensory table, felt board, and art center. Many of the materials in each center can be integrated into more than one center. With thoughtfully designed centers, children flow from one activity to the next with a sense of purpose. The art center is a place where children can construct all sorts of creations. Pine cones, tree bark, and other natural treasures are piled into the science center with an old overhead projector for light study. Cuisenaire rods, pattern blocks, and counting grids encourage geometric design at the math center. The block center is where children’s imaginative worlds come to life. Creativity and invention stem from some of the simplest materials, and having access to these materials can make the difference in a child’s ability to learn. Other materials are introduced to expand thinking on a certain topic or theme. For example, later in the spring, the sensory table will be filled with soil and the students will begin a scientific study of worms that will eventually lead the students outdoors to the garden. I had an initial hesitation surrounding play-based learning because I worried that it would impact my ability to teach district-mandated programs or address required academic standards and assessments. But observing young students as they played gave me new insight on the ways they think and learn. I was able to use that knowledge and address their individual needs more effectively. Children were more motivated to explore academic standards within their play because it was meaningful to them. After reading Miss Maple’s Seeds last fall, the children became fascinated by the knowledge that Eliza Wheeler had created the pictures and story from her imagination. They grew curious about how the book was made. After discussing the book-making process in our circle, a child exclaimed, “We can make books, too!” A few minutes later, a group of children set off to the art center to create books of their own. The collaborative work of story writing incorporates speaking, listening, and writing standards. Book making has since become a favorite activity, carrying over into other areas of learning. This winter, a child made a number book and brought it to our math circle to share with the class. Number books quickly became the rage, with each one a little different from the next. One child began a book about groups of 10. A friend offered support by popping up from the table to reference the number grid on the wall. They soon reached 200. Given time, space, and materials, these children were able to explore mathematical concepts at their ability level while also contributing to other children’s understanding. Educational consultant Mike Anderson describes this kind of “self-differentiation” as the place in which learning is “most effective” and “enjoyable”—in other words, their zone of proximal development. Understanding how play supports learning means understanding how children learn. Just as a tree’s roots form a foundation on which the tree can thrive, our teaching must have roots in child development in order for children to thrive. Once my students had experienced play-based learning, they were more focused, motivated, and purposeful. Most important, they were happier. Bringing play-based learning to my classroom created balance, deepened our learning, and defined our classroom community as a place where we could learn and grow together.